Photo credit: Glenn Asakawa/University of Colorado. 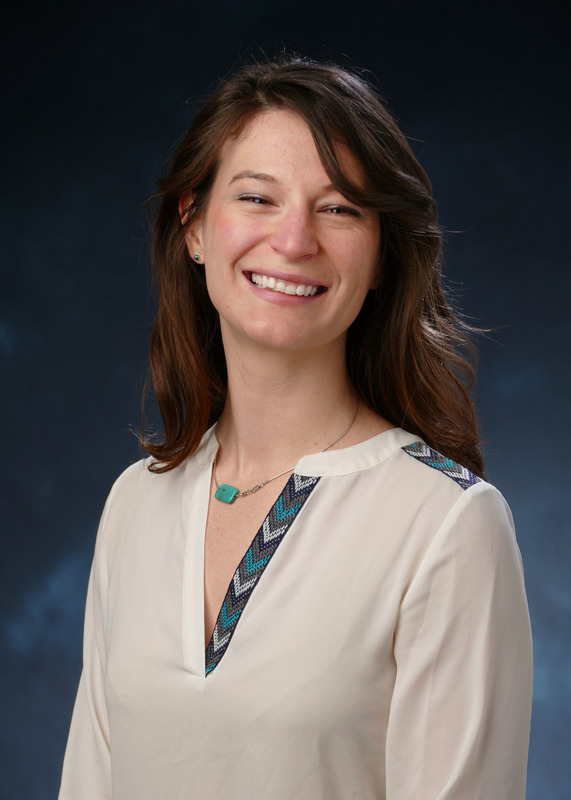 Tess Eidem, Ph.D. is a Ruth L. Kirschstein National Research Service Award (NRSA) Postdoctoral Fellow in the Goodrich-Kugel Laboratory in the Chemistry and Biochemistry Department. Tess has a passion for science communication and outreach and was recently awarded a travel grant to attend the Advocating for Science Symposium at the Massachusetts Institute of Technology, where participants discussed the challenges faced by scientists and alternative paths one can pursue with a Ph.D.
–Ben Corb, Director of Public Affairs of the American Society for Biochemistry and Molecular Biology (ASBMB). 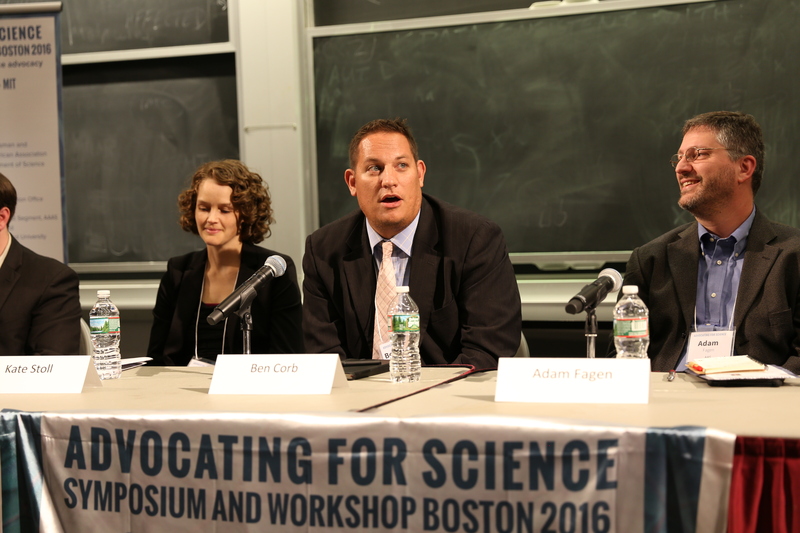 Kate Stoll, Ben Corb, and Adam Fagen participate in a panel discussion at the Advocating for Science Symposium. Photo Credit: Alina Chan, Future of Research. 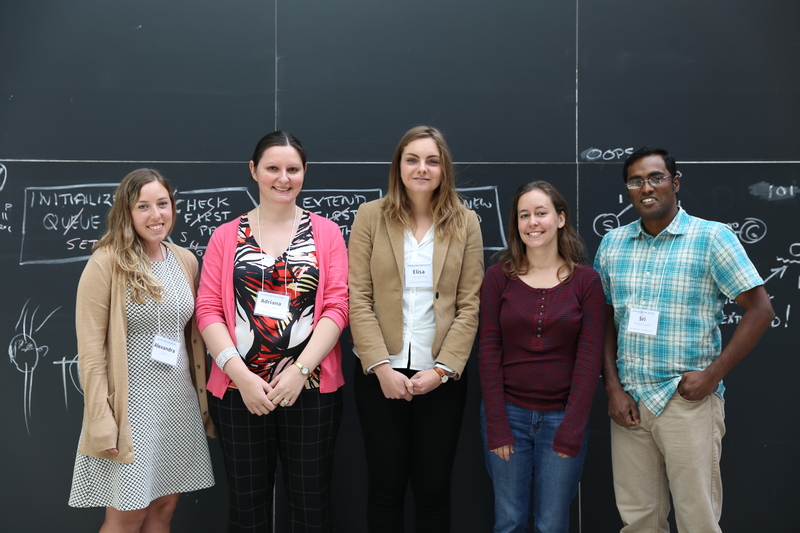 The symposium consisted of workshops and interactive panels with policy leaders and communicators designed to help scientists distill their message for a lay audience and explore alternative career paths in science communication, policy, and media. The program also featured a keynote presentation by Dr. Rush Holt, former Congressman and CEO of the American Association for the Advancement of Science (AAAS). Many of these presentations can be viewed online at the Advocating for Science Symposium Webcast. I was very fortunate to receive an Advocating for Science Symposium Travel Award from the Future of Research (FoR) to attend the symposium. 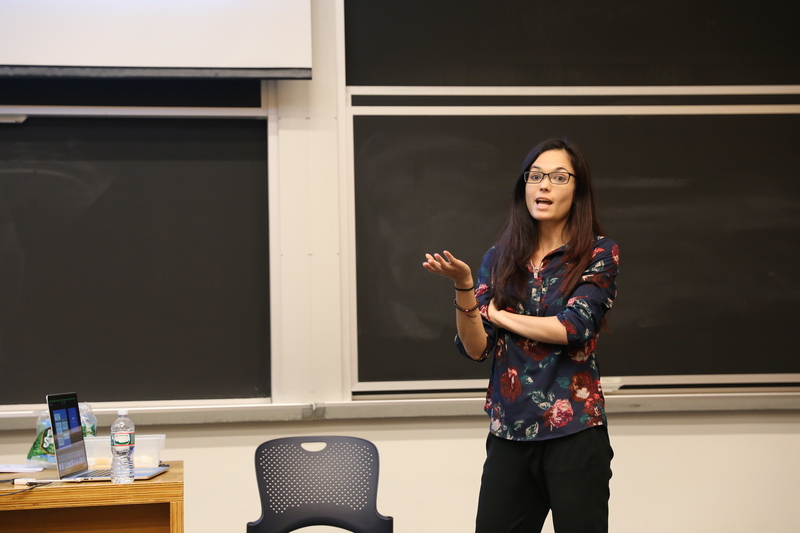 FoR started as a grassroots organization of postdocs in the Boston area with the goal of understanding the complexities of the scientific enterprise and creating a platform for early career scientists’ voices to be heard. FoR has been building momentum over the last three years, tracking and surveying Ph.D.’s, publishing current challenges in the academic research setting, including Shaping the Future of Research: a perspective from junior scientists, hosting science advocacy meetings nationally and internationally, and helping others organize their own FoR Symposium. 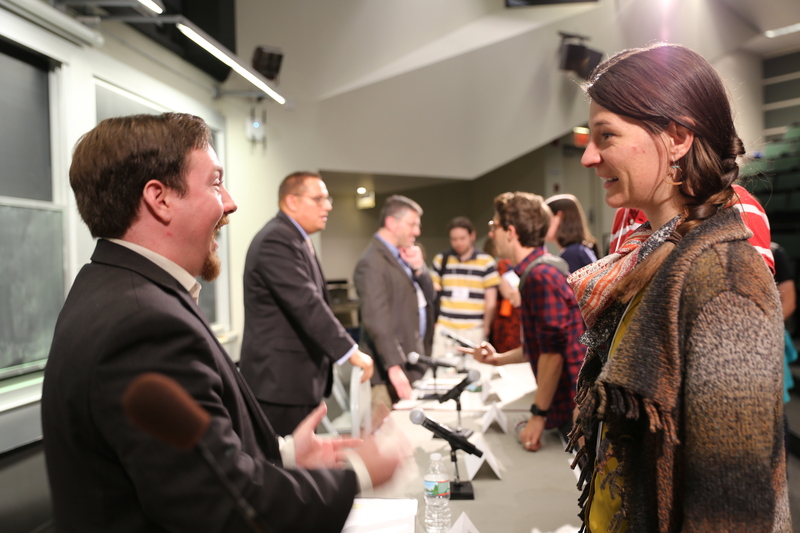 Daniel Curtis, MIT Graduate Student Council External Affairs Chair, and Tess Eidem chatting following the discussion panel. Photo Credit: Alina Chan, Future of Research. The Advocating for Science Symposium provided many valuable resources, including information on where a biology Ph.D. will take you, publications that describe the current challenges in the academic research setting, and opportunities to write to your local government representatives to Help Save Science. I was happy to hear about the growing number of policy and media programs that immerse scientists in government and communication, including the CU Boulder and AAAS Workshop Catalyzing Advocacy in Science & Engineering for graduate students and the AAAS Mass Media Science & Engineering Fellows Program, to name a few. I was also excited to learn that scientists can participate in the National Academy of Sciences Science & Entertainment Exchange to contribute to scientific accuracy in movies and TV programs (hopefully avoiding some of these hilarious disasters: thatsnothowyoupipette). I’ve always used PowerPoint to make my figures and presentations, but I can’t wait to try other visual communication tools and tutorials like those offered by Canva. I particularly enjoyed the “Making your own infographic” activity by Dr. Christine Oslowski, which walked participants through the steps of designing a catchy and visually appealing infographic using data from a survey we filled out earlier that day. Dr. Oslowski describing the dos and don’ts of graphic design. Photo Credit: Alina Chan, Future of Research. To overcome the current obstacles faced by the scientific community, it is imperative that we nurture all of our skills and talents to turn these challenges into opportunities. After attending the symposium, I feel more prepared to develop, hone, and implement my diverse skill set as a science advocate; moreover, the conference brought together an amazing group of scientists who are motivated to do the same. Perhaps most importantly, this symposium confirmed that a scientist is much more than just a researcher; we are entrepreneurs, communicators, managers, mentors, artists, and effectors of change—all wrapped up in one lab coat. Acknowledgements: Many thanks to Brian Aguado for his helpful comments and suggestions. An earlier draft of this post can be found at the website of the Biofrontiers Institute at the University of Colorado.